A comprehensive guide and fact sheet about the Palermo Stone. Discover fascinating facts and information about ancient Egypt and Palermo Stone. Click a link for additional information and interesting facts about subjects relating to Palermo Stone or other aspects of daily life, the people and places of ancient Egypt. 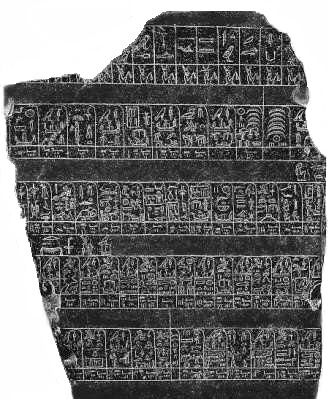 Definition of the Palermo Stone: It is a large fragment of a black basalt stone, a stele known as the Royal Annals of the Old Kingdom of Ancient Egypt. It contains a hieroglyphic list of the mythical deity-kings and predynastic kings of Egypt followed by the kings of the first five dynasties. The stele was originally about 2.1 metres (7ft) tall by 60 centimetres (2ft) wide although it was broken into several pieces. This particular fragment of stone is now displayed in the Salinas Regional Archaeological Museum in Palermo, Italy, from which it derives its name. Fact 1 on Palermo Stone: A stele, or stelae, is an upright stone or slab with an inscribed surface, used as a monument or as a commemorative tablet. Fact 2 on Palermo Stone: The name of this ancient artefact is derived from the Museum in Palermo, Italy where it has been housed since 1866. An unknown French scholar recognised its significance in 1895 and its contents were first published by Heinrich Schafer in 1902. Fact 3 on Palermo Stone: The 'Palermo Stone' is only a small fragment of what was once a large slab. Several, less important, fragments of this slab are in museums in Cairo and London. Fact 4 on Palermo Stone: The stele is extremely important as it is the source for the chronology of ancient Egypt and its early kings and important historical events. Fact 5 on Palermo Stone: The stele contains valuable information about the economic, military, and religious policies of the rulers of ancient Egypt. Fact 6 on Palermo Stone: Specific types of information included details of warfare, the taxation system, important festivals, buildings and sculpture and the height of the annual Nile floods in various years. Fact 8 on Palermo Stone: The text on the stele was evidently was compiled from a range of historical documents. Fact 9 on Palermo Stone: The hieroglyphic carvings document the names of a number of early gods, such as Heryshaf, the ram-headed creator god of fertility whose cult center was based at Heraklepolis and also includes reference to Min the god of sexual procreativity who was honoured in the coronation rites of the Pharaohs to ensure their sexual vigour and the production of a male heir. Fact 10 on Palermo Stone: The ancient stone was inscribed on both sides with the earliest known Egyptian hieroglyphic text that is carved in horizontal lines. Discover fast, interesting fun facts about the Palermo Stone for kids with some amazing, cool and quick information about ancient Egypt and Egyptians. Ideal for children, homework, schools, teachers and kids of all ages! Find fascinating fun facts about the Palermo Stone for kids and the history, culture and civilisation of the ancient Egyptians and ancient Egypt. Interesting, fun facts about the Palermo Stone for research, schools, students and kids of all ages. Learn about the Palermo Stone the fast and easy way via the Palermo Stone Fact sheet. Fact 11 on Palermo Stone: The commemorative stele is believed to have originally stood outside an Egyptian temple. The stele was originally about 2.1 metres (7ft) tall by 60 centimetres (2ft) wide and 6.5 cm thick. The stele was broken into several pieces, some of which are missing resulting in incomplete or illegible text. Fact 12 on Palermo Stone: The top row of hieroglyphic text listed the names of predynastic rulers. Fact 14 on Palermo Stone: Each of the compartments signified one year. Fact 15 on Palermo Stone: The hieroglyphic text in each of the compartments always listed one, or more, memorable events of that year. Fact 16 on Palermo Stone: This provided a year-by-year record of all the ancient Egyptian kings from the 1st dynasty of rulers to the 5th dynasty. Fact 17 on Palermo Stone: The serekh was the earliest convention used to set apart the royal name in ancient Egyptian iconography, before the cartouche was used. A serekh is a rectangular enclosure representing the gated facade of a palace usually surmounted by the Horus falcon that indicated that the text enclosed was a royal name. The following image taken from the stele provides an illustration of a serekh, followed by symbols of the authority of the king and events of the year. The name of the king was Nynetjer who was the third king of the 2nd dynasty. Fact 18 on Palermo Stone: The above hieroglyphic relating to King Nynetjer clearly shows the sacred symbol of the honey bee which was associated with royal titles and is conventionally translated as 'King of Upper and Lower Egypt' or 'King of the South and North'. Fact 19 on Palermo Stone: The hieroglyphics from the reign of Nynetjer contains events of the years including details of flood levels, festivals relating to the "Race of the Apis bull" (refer to the Apis Bull), the celebration of the Sokar feast and a burial ceremony "Feast of eternity" and a celebration giving offerings to the king's mother and the "stretching the cord" ceremony relating to the foundation of a temple and the destruction of a city. Fact 20 on Palermo Stone: The 'stretching the cord' ceremony, ritual and measuring process was known as Pedjeshes during which the reigning pharaoh and a high priestess personifying the goddess Seshat the "Mistress of the House of Architects" attended a ceremony at the site. Learning about the ancient Egyptians and Palermo Stone inspires everyone to visit historical sites and undertake Egypt Travel and Tours to experience the wonders of this magical land at first hand. 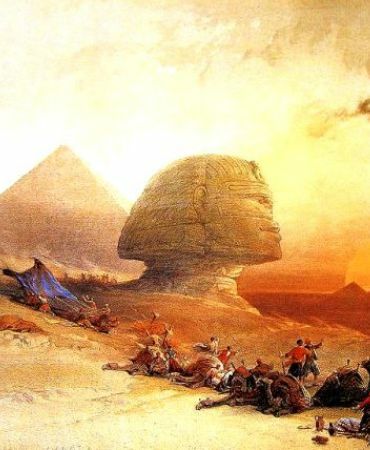 Many people choose to experience a tour of Egypt on a Nile Cruise stopping at the famous destinations and sites of Egypt such as the Pyramids of Giza and the Great Sphinx. The information and facts about the Palermo Stone will provide you with a great insight into Egypt and the legacy of the ancient Egyptians.